KUWAIT: Kuwaiti clubs yesterday elected the head of a new football federation that hopes to win recognition from FIFA and end a ban from international tournaments over alleged government interference. Sheikh Ahmad Al-Yusef Al-Sabah said his first priority would be to persuade the sport’s world governing body to lift the ban. World sports bodies led by FIFA and the International Olympic Committee suspended Kuwait in Oct 2015 for the second time since 2010 over alleged government meddling in sports. 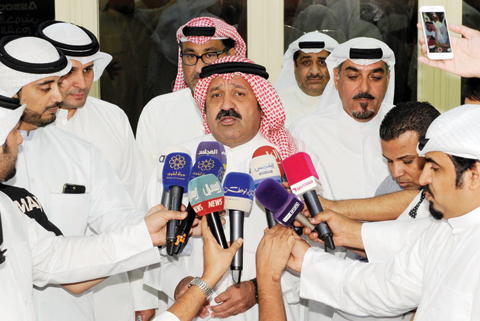 In 2016, authorities dissolved Kuwait’s sports bodies including its Olympic committee and football federation. It later set up temporary committees in their place, but FIFA and the IOC have refused to recognize those bodies. With Tuesday’s election, the new federation gained the recognition of the majority of the country’s football clubs. Sheikh Ahmad said he had “many goals, first and foremost lifting the suspension”. The new federation “has given me a bigger responsibility than I was expecting”, he added. Analysts say Kuwait’s sports crisis, which has blocked the country from taking part in international competitions, is the result of a power struggle within the ruling elite. Kuwait has been barred from taking part in qualifiers for the 2018 World Cup, the 2019 Asian Cup, and before that the Rio 2016 Olympic Games. Kuwait’s public sports authority in December wrote to the IOC and FIFA urging them to “lift the ban on Kuwaiti sports activities temporarily until relevant local laws are revised”, but they refused.